Is added to product price. A real shamrock mounted on a beveled Linen mat, under glass in a custom made Mahogany finished wood frame with Black Accent. Includes an Acrylic Table-Top Easel Display and can also be wall mounted. 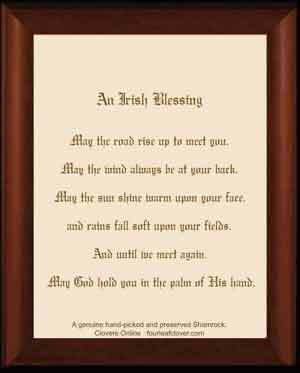 Back of frame has the Irish Blessing. 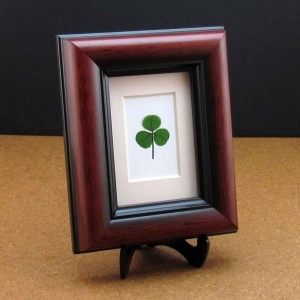 Frame is 4 1/8" X 5 1/8" and comes gift boxed with shamrock fact sheet.